On Friday evening, 21st November, a two year programme of review, discernment and planning in the United Dioceses of Cork, Cloyne and Ross was launched by the Archbishop of Armagh, the Most Reverend Dr Richard Clarke. Thanking the Archbishop for travelling to inaugurate formally the Diocesan programme, the Bishop of Cork, Cloyne and Ross, the Right Reverend Dr Paul Colton, described the Archbishop’s address as ‘inspiring, challenging and very motivating.’ The residential conference to begin the work of ‘Charting A Future with Confidence’ continues today at the Charleville Park Hotel, Charleville, County Cork. 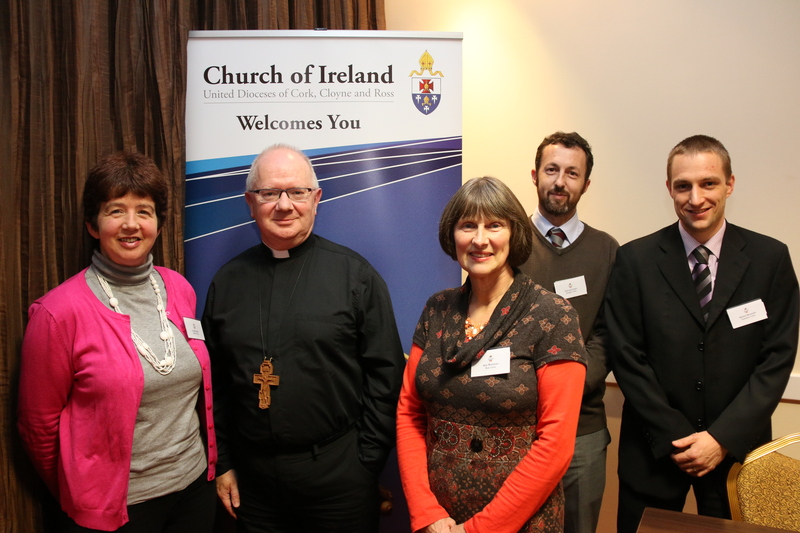 The Archbishop of Armagh (second from left) at the inauguration of ‘Charting A Future with Confidence’ with l-r Linda Deane, Ann Buttimer, Edward Gash and Melvin Beamish.